Defence Minister Stephen Smith has announced the RAAF will buy a sixth Boeing C-17A transport. Speaking at a ceremony to mark the delivery of the RAAF’s fifth aircraft in the fleet, A41-210, at Amberley on September 23, Minister Smith said a formal Letter of Request had been submitted to the US government the previous day for the purchase of a sixth aircraft through the Foreign Military Sales (FMS) system. The original fleet of four C-17s, which was announced in February 2006 and delivered from December that year, was bolstered earlier this year by the acquisition of the fifth aircraft, which was ordered in early April. 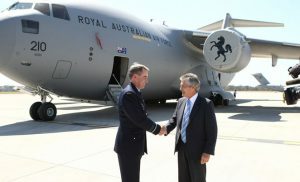 The fifth aircraft was delivered in a remarkable 142 days after it was ordered due to an urgent requirement from the RAAF to cover heavy maintenance of its first C-17, but assuming both the US and Australian governments approve its purchase on schedule, the sixth aircraft isn’t expected to be delivered until the fourth quarter of 2012.